Abacus has a seamless integration with QuickBooks Desktop for both reimbursable expenses and corporate card expenses. How does the sync work for reimbursable expenses? The sync to QuickBooks is triggered by admin approval. Once the batch debit is created (this happens on a nightly basis whenever expenses are approved), the Bill and Bill Payment will sync. 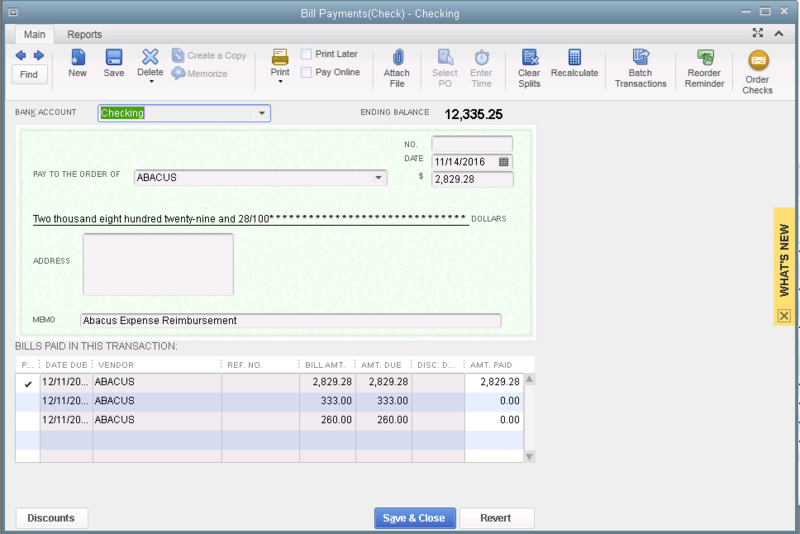 Each expense included in the batched debit will be booked to the correct expense account. The memo of the line item for each expense includes the Abacus user, note, vendor, and a link back to the original expense so that you can view the receipt image. Abacus will be the vendor on the Bill and Bill Payment. We use a Bill and Bill Payment to make it efficient for you to reconcile to the periodic bank debits, while still giving you the full line item granularity for each expense that you need to properly roll up to the income statement, e.g. Account, Class, etc... a Bill can only have one Vendor, so Abacus is the Vendor because we're responsible for the reimbursement payments. 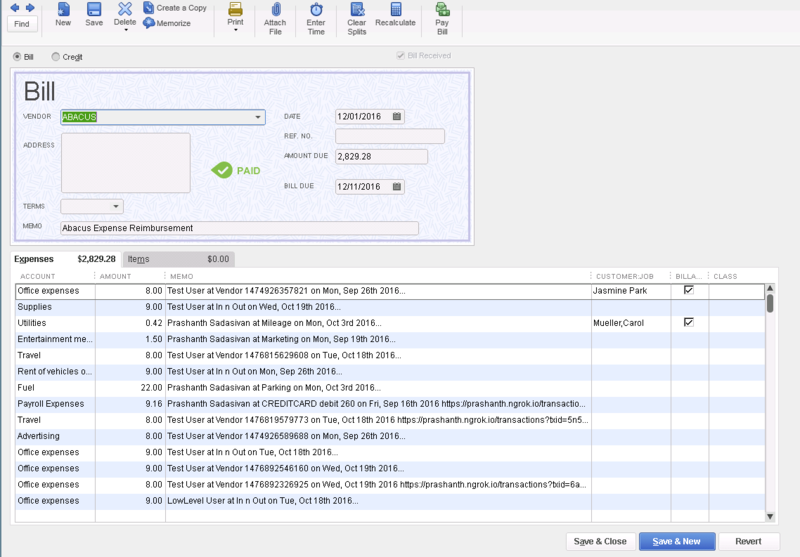 How does the sync work for corporate card expenses? Abacus will sync corporate card transactions to QuickBooks after they are reviewed and approved by an Abacus Admin. Admin approval is what triggers the sync to QuickBooks. The corporate card transactions will be sent to the corresponding register, where they will match up against the corresponding transaction for fast and easy reconciliation. QuickBooks gives you the option to import your credit card statement into your books. Instead of manually accounting for each transaction, Abacus syncs the matching data in so that you'll already know the expense account, business description, etc. To reconcile, first navigate to the bank feed that's managing your corporate card statement, and view your transaction list. QuickBooks utilizes a matching logic that attempts to match corporate card transactions with the corresponding record that Abacus creates. Some will be auto-matched and some will need your review. 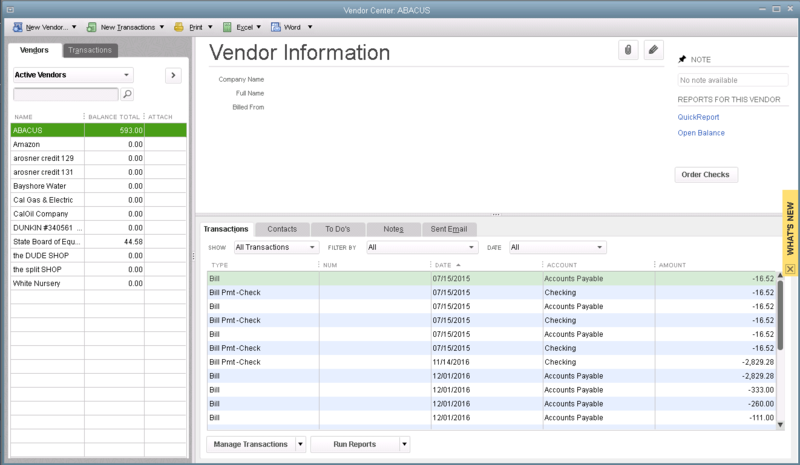 Then you will be able to select from the records that Abacus has created in your QuickBooks. Because QuickBooks Desktop is not cloud-based, we work with WebConnector to help facilitate the transfer of data between Abacus and QuickBooks. Here's the sequence of events for the Abacus sync to QuickBooks. Most WebConnector settings are set up to sync in the background every 60 minutes. However, if you want to update the sync manually or on a one time basis, you can update Abacus in Web Connector (File > Update Web Services).